There are usually two camps of people when it comes to cranberry sauce at Thanksgiving; those who swear by the effortless canned gelatinous cylinders and the rest of us. I have never understood the draw of canned cranberry sauce and once I found this recipe I decided it is no longer necessary to try. 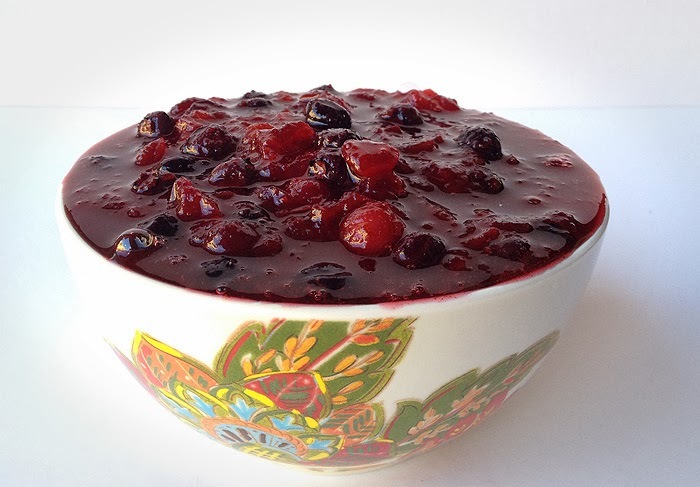 This blueberry cranberry sauce is smacking with the flavors of fresh berries and warm spices; and is one of those amazing dishes that gets better with time. I make mine the night before; it gives the flavors time to meld and takes one thing off my Thanksgiving Day to-do list. Simple to make, fresh and the perfect completion of your holiday meal, this homemade sauce is full of antioxidants, vitamin C and fiber. With all the starches and carbohydrates on the table, it is a nice break full of color and flavor. I also use this sauce as a condiment on my leftover turkey sandwiches and as a topping on ice cream. Get creative, add the sugar to taste and choose your level of tartness. Join me by trying this sauce and banning the canned crappy cylinders from ever entering your house again! Wash and pick over cranberries. Place in a medium saucepan with water, and sugar. Bring to a boil, reduce heat, stir and simmer for 10 minutes or until cranberries burst. Slightly mash the cranberries with the back of a wooden spoon to insure all skins are broken. Add the cinnamon, nutmeg and allspice. Mix well. Remove from heat and mix in the blueberries (don't be afraid to break a few, but don't over mash either). The sauce will thicken as it cools. Transfer to a bowl, cool slightly and place plastic wrap directly on top of sauce to cover. Refrigerate until chilled. Yum, I love it! Love the addition of blueberries! This is an awesome recipe!